I have vivid memories of attending Mass throughout my childhood and youth and listening to the priest, financial parish secretary or visitor explain, as an auditor would, why there wasn’t enough money or why they needed more. The person speaking said something like this: “We are doing fantastic work, but we can only continue because of your financial support. Therefore, please give.” Browsing the faces around me, I noticed most people passively listened, waiting for the speaker to finish. The unfortunate part was the joy of celebrating the Mass was disrupted by a tepid, five-minute request for money. Fast forward to today, after experiencing countless Sunday appeals and second collections, I recognize that most requests for funds are dull and disruptive. My assumption is you agree with me. I understand the importance of giving, and I enjoy supporting Catholic causes, but I have come to the conclusion that the only reason they asked me is that I was sitting in the pew, unable to run away. Everything else is secondary, such as how diligent the organization is in managing money, how faithful they are to Church teaching, or how successful they are in their mission. Their stewardship of my generosity is never discussed. The following Sunday, if lucky, I may hear, “Thank you for your generosity. We raised [the amount].” The end. I won’t hear anything from them until the following year when I am asked to replicate my generosity. Repeat this scenario 30 or 40 times, and this is what most Catholics experience each Sunday throughout the year. Our fundraising culture is founded on dull, disruptive appeals, one after another, with minimal stewardship on the part of the recipient. This method of fundraising, which dominates the Catholic Church, along with other methods such as auctions and dinners, has undoubtedly accomplished much over the past decades. At the same time, these methods appear to be gaining rust. Statistics on the level of giving by Catholics has remained low (in comparison to Protestant denominations) and stagnant for several decades, and there appear to be no signs of any increases. As the number of Catholics attending Mass on Sunday continues to decline each year, fewer people are sitting in the pews to listen to these appeals. Therefore, we can assume that the trajectory of giving in the Catholic Church will continue to decline. The priest of one parish confessed to me that, after years of appeals, he is so tired of the constant requests for his flock’s money, that he just doesn’t allow any more appeals. Other priests, though they haven’t taken this decision, reciprocate the feelings. As a fundraiser, I’ve spoken to many Catholics about these topics. They’ve told me that they are drained by the constant requests and disruptions at Mass. What’s more interesting, most have admitted they would happily give (and give more) if they were asked differently. Therefore, I must ask: What alternative methods can we consider to raise funds more effectively in the Catholic Church? To answer this question, I have read as many books as I could about Catholic fundraising. There is, unfortunately, not a lot of practical material available that explains step-by-step for how to raise money for Catholic organizations. Most Catholic authors focus on the theological and pastoral implications. In my experience, this lack of practical and Catholic references is a major issue. I’ve also spoken with countless fundraisers. We could refer to resources for non-Catholic, charitable fundraising. I, however, don’t think the solutions they offer align with our Catholic culture of giving. Unlike other donors, Catholics give because it is a fundamental act of our being. We are created in the image and likeness of God, and Jesus Christ demonstrated that we give because this is how God created us. We give regardless if someone asks. Therefore, using fundraising tactics to improve conversion rates or response rates to increase Catholic giving seems pointless. Those are not the problems. From my perspective, after spending the last five years navigating the ever-changing landscape of Catholic fundraising, I see the solutions elsewhere. Catholics are eager to donate; however, they are looking to give to organizations that are faithful to Church teaching and don’t disrupt them during Mass. In light of what I’ve seen that works, I recognize three overarching trends that will shape the future of fundraising. As I previously mentioned, with the number of people attending Mass on the decline, and the overall negative mood about appeals, we must be open to different forms of asking people for donations. In the past, fundraisers could too easily and without much pushback ask Catholics to give while they sat in the pews. Today, however, Catholics are not so easily swayed. There are a lot more options for them to give their money. Before, it was a seller’s (fundraiser’s) market. Now, it’s a buyer’s (donor’s) market. If a Catholic doesn’t like the approach, they are less afraid not to give. How to respond to this environment? The first step is to steward people’s donations properly through active and informative communications about how their money is spent. Second, I recommend asking people how they would like to give and respond appropriately. If they don’t like giving during Mass, find alternatives. I do the majority of my fundraising during the week, rather than on Sundays, and I’ve managed to raise funds successfully each year. I wrote an article about how to better communicate which you can access here. Most Catholic charities still run direct mail campaigns, distribute paper leaflets and speak at Sunday Masses. These methods are cumbersome, outdated and costly. Also, they produce tremendous waste as everything is printed, posted and filed somewhere in a room, never to be seen again. However, with information technology, these tasks have become significantly easier to manage and cost next to nothing. Today, you can run an entire fundraising campaign without disrupting Mass or spending hundreds on mail or leaflets. With donor relationship management software, you can track and maintain all your donor relationships in real-time throughout the year. Instead of speaking to people who stare at you listlessly from pews, you can contact them individually via email and phone. What’s even more feasible is meeting people in person who wish to give. In the past, waiting for someone to respond to a letter could take over a week. Now, you can organize meetings in a matter of minutes. Technology offers you the options and capacity to fundraise more quickly, while dramatically reducing your costs. And if you are worried whether this kind of software is expensive, it is not. Many companies offer reduced or free packages for charitable organizations. I think this is the most significant trend. Before, fundraisers would send the same message to thousands of people. Now, with the help of technology, you can tailor your messages without spending the hours it used to take. You can personalize all your communications (letters, emails, phone calls, notices, appeals), offering a more intimate relationship with each of your donors and prospects. You can also immediately identify your best prospects by a click of a button, allowing you then to organize one-to-one meetings that have the greatest potential of generating new donations. You don’t have to shout ‘donate’ from a pulpit to an audience in hopes that a few will give. Instead, you can focus your time connecting with people directly who are interested in hearing what you have to say. By individualizing your messages, you can ask for donations to people most interested in giving. Then, with those people aren’t ready to give but would be interested in learning what you do, you can share what your organization does, potentially capturing their attention to donate in the future. And if someone is already giving, you can share how their money has made a difference, rather than asking them for more money. Let me illustrate one example of how I used these three trends recently. For some years, an organization hosted an event every other summer. Guests came to the event to hear the director provide a review of what had been achieved since they last met. She finished by thanking everyone for their support. The event was, for the most part, a formality with little opportunity to increase the fundraising revenue. They, like so many organizations, had the vision to grow but didn’t know how to ask people for money, and they were afraid to ask their current donors for more. With my guidance, we implemented these three trends; change, technology, and individualization, throughout the year. We took extra care in how we communicated when we spoke to people and spent a lot more time listening to why they would consider. When it came time to host the next event, 80 dedicated followers and donors attended, twice as many as the year before. From all the careful work we had done during the year, the event was now a catalyst for new donors and more donations. Even more, it provided enthusiasm and a spirit of collaboration, as everyone left that night excited about the future. The event raised $45,000 (a significant sum for the organization). What’s more impressive is we didn’t disrupt the event by asking guests to complete a donation card or write a cheque during the event. Donations came after we communicated individually with each guest, asking if they’d enjoy speaking in more depth about our work and their support. Many agreed because our method was personal, unobtrusive and unique. They were delighted to meet us individually because they loved what we did, and they enjoyed the opportunity for an intimate conversation. The demands to evangelize and bring Jesus Christ and His Catholic Church to people are as vibrant as ever. Yet, fundraising presents a major hurdle for most Catholic organizations, especially when they are starting out or trying to expand, because they don’t know how or they cannot afford the services of a fundraiser or fundraising firm. I think tremendous opportunities await anyone who wants to leverage these three trends and overcome the challenges of fundraising. By leveraging these ideas, the moment is ripe to look at fundraising with fresh eyes and make significant progress. NOT SUBSCRIBED TO RECEIVE THE WEEKLY CONTENT? FIX THAT! IT’S COMPLETELY FREE. Brice was born and raised Catholic. After enjoying a successful career in technology consulting with Accenture and PriceWaterhouseCoopers in cities across the United States (Dallas, San Francisco, Paris, Abu Dhabi, and London) around the world, he left it to help his Catholic diocese in London, England with a fundraising campaign. The campaign went on to raise over $60 million, the largest sum ever raised for the diocese and in the United Kingdom. Learning from professional fundraisers, he figured out the basics and then left the diocese to focus on what he loves most: building Catholic charities that change the culture, save lives, and save souls. Brice currently lives in Texas and travels the world helping Catholics fundraise. This website is where he shares what he is doing and how he is raising funds for Catholic causes and missions. That way you can move more quickly with your next appeal. 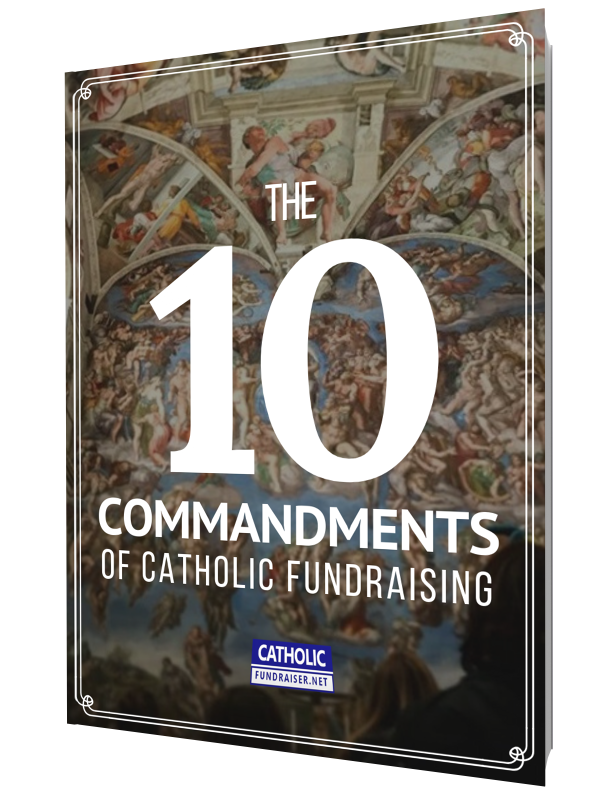 Download for FREE The Ten Commandments of Catholic Fundraising and learn the 10 practical steps you can take today to attract more donors, raise more funds, and move your mission forward. Your details are kept safe with us, and not shared. Mother Mary, pray for us. CatholicFundraiser.net is the #1 Catholic website for training, advice, and resources to Catholic apostolates, religious communities, and non-profits who want to strengthen their missions in the era of the New Evangelization. CatholicFundraiser.net is the only website that provides 100% Catholic online training, advice, and resources for Catholic organizations, religious orders, and missionaries around the world who want to strengthen their missions in an era of secular, money-focused fundraising tactics.